Very roughly speaking, DeLong’s argument is this: everyone agrees that Germany is the poster child for an advanced economy with a great manufacturing policy. And yet, their manufacturing employment has steadily declined for the past half century too, just like ours. So if this has happened to Germany, there’s not much of a case for suggesting that the US has done anything especially wrong over the past 50 years. We’ve simply evolved from a (relatively) poor manufacturing nation into a (relatively) rich services and technology nation. This has nothing much to do with trade policy, either. It’s just what rich countries do. What’s more, it’s a decidedly good thing overall, even if it does affect a smallish number of people badly. But, hey, I’m sure dropping TPP and making a better deal on NAFTA will create a boom in manufacturing jobs in Ohio, PA, etc. Oh, and I’ve got a bridge to sell you. This is almost too amazing too be true. 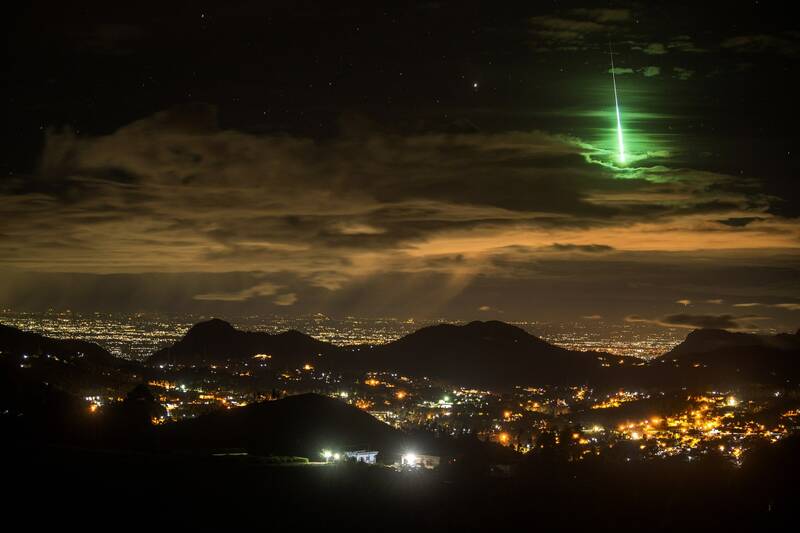 A meteor over India via Wired. Trump specializes in lower-status lies, typically more of the bald-faced sort, namely stating “x” when obviously “not x” is the case. They are proclamations of power, and signals that the opinions of mainstream media and political opponents will be disregarded. The lie needs to be understood as more than just the lie. For one thing, a lot of Americans, especially many Trump supporters, are more comfortable with that style than with the “fancier” lies they believe they are hearing from the establishment. For another, joining the Trump coalition has been made costlier for marginal outsiders and ignoring the Trump coalition is now less likely for committed opponents. In other words, the Trump administration is itself sending loyalty signals to its supporters by burning its bridges with other groups. These lower-status lies are also a short-run strategy. They represent a belief that a lot can be pushed through fairly quickly, bundled with some obfuscation of the truth, and that long-term credibility does not need to be maintained. Once we get past blaming Trump for various misdeeds, it’s worth taking a moment to admit we should be scared he might be right about that. So the overall picture is this: The Trump administration trusts neither its own appointees nor its own supporters, and is creating a situation where that lack of trust is reciprocal. That is of all things a strategy for getting things done, and these first one hundred days are going to be a doozy. Are you down with TPP? Yeah you know me. President Trump, like many others, is right to be concerned about people losing factory jobs, particularly in the Rust Belt, which delivered his victory. The T.P.P. probably would have killed some jobs there, and it surely would have created some others. Estimates suggest that it would have been a wash. But, over all, it wouldn’t have had much direct impact on blue-collar workers. The global shift away from tariffs and other trade barriers began in 1964 and was, largely, complete by the mid-two-thousands. There are a few real fights left, particularly over trade involving finance, entertainment, and pharmaceuticals, but, for American manufacturing companies and their workers, there just aren’t that many high trade barriers left. No deal is likely to have a significant impact on the number of jobs or on the wages workers receive. Jobs ultimately follow economic activity. Where are the customers? Where does it make the most sense to produce the goods those customers want? Short version: not horrible, but certainly a move in the wrong direction. What if a Florida tomato could be left on the vine long enough to turn red and fully develop its flavor — and still be ripe and juicy when it arrived at a grocery store in New York days later? That is precisely the promise of a start-up here in Southern California, Apeel Sciences, that aims to make obsolete the gas, wax and other tricks growers use to keep fruits and vegetables fresh over time. Using leaves, stems, banana peels and other fresh plant materials left behind after fruits and vegetables are picked or processed, Apeel has developed a method for creating imperceptible, edible barriers that the company says can extend the life of produce like green beans and berries by as much as five times. Apeel can even deliver a day-of-the-week bunch of bananas, each ripening on a different day. An Apeel product already has been used to stretch the shelf life of cassava in Africa. Awesome!!! And, here’s where I mention, I’m loving the bumper crop of Chilean blueberries. Fresh blueberries for $3/pint in January (hooray, Southern hemisphere) means I’m back on fresh blueberries instead of frozen for now. But, in general, this is really, really cool. Another effort to alter that trade-off is SmartFresh, a product developed with Professor Watkins’s research that keeps apples from ripening too quickly in storage. Apeel’s products, sold under the brand names Edipeel and Invisipeel, take plant materials and extract all liquids from them to produce tiny pellets. The company then uses molecules from those pellets to control the rate of water and gases that go in and out of produce, thus slowing down the rate of decay. The version of Apeel for avocados, for example, creates a barrier that effectively fools anthracnose, a fungus that exploits tiny cracks that develop in the fruit’s skin when it begins to shrivel. Anthracnose extends a little leg through those cracks and into the fruit itself, creating the ugly brown spots that are such a nasty surprise when an avocado is opened. Edipeel can stave off anthracnose by up to 30 days longer than existing techniques for combating the fungus. “It basically sees a different molecule than it’s used to seeing and moves on,” Mr. Rogers said. Invisipeel can be applied while crops are still in the field. Edipeel can be applied after a harvest; crops can be coated while on a conveyor belt or dipped in the solution. So far, the products are derived primarily from the remains of produce that has been certified organic, like grape skins left over from wine production and stems left behind after broccoli is harvested. They can be easily washed away with water. And, maybe, I’ll get decent-tasting apples in January through March until the Chilean and New Zealand apples finally show up in April. Personally, I’ll buy them just to support the effort (and to try and get my son Evan to eat more fruit). Anyway, no matter what, the future of fruit looks to be different and better.